"...KA2- Yeoman V. Originally from England, owned by Owen Aisher, Sailed as GBR 008. First owned in Australia by Frank Harrison about 1960..."
According to information from the National Maritime Museum in Greenwich, UK (from their Camper & Nicholsons Ltd files and Lloyd's Register of Yachts), Yeoman V was GBR-4 (K-4). Owned by Owen A. Aisher 1955-61, and designed and built 1955 by Camper & Nicholsons (Design No A102, Yard No 810). Sail letters of Yeoman 5 were SA-4 in Melbourne 1956. KA-8 Yeoman 5 is a design of Charles Arthur Nicholson and built 1955 by Camper & Nicholson, hull #810. 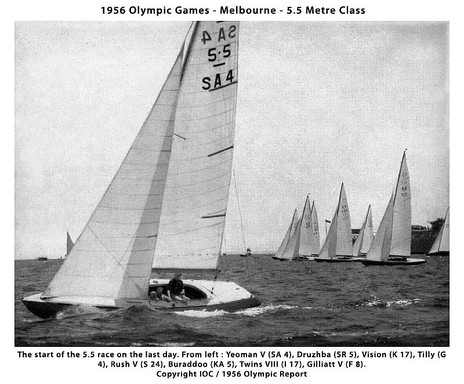 "Yeoman V" was sailing for South Africa in the 1956 Olympics. If Skipper Leslie Horsfield just added an "S" to the existing sailnumber - like he presumably did in Helsinki to K-19 - he will have sailed 5.5 KS-8 "Yeoman V" in Melbourne.